Aortic aneurysm repair involves the removal of a dilated (enlarged) portion of the aorta replaced by a woven or knitted Dacron graft to continue uninterrupted blood flow through the aorta and all branch vessels. Aortic aneurysm repair is performed when a portion of the aorta has become dilated as a result of medionecrosis in the ascending aorta or atherosclerosis in the arch and descending segments. Congenital defects in connective tissue are also a risk factor. A history of blunt trauma may be associated with this disease propagation. Prior to 1950, patients exposed to syphilis were at risk of developing aortic aneurysm. Risk of clot formation and rupture of the aneurysm, seen in 50% of cases, as well as dilation to a size greater than 4 in (10 cm) promote repair of the aneurysm by surgical techniques. The patient population for this procedure is typically male with an average age of 65 and a history of medionecrosis or atherosclerosis of the aorta. Patients with a medical history significant for syphilis or blunt trauma are at risk. Congenital defects associated with Marfan syndrome or Ehlers-Danlos syndrome (congenital tissue disorders) need to be monitored. All patients will be monitored until the aneurysm demonstrates consistent enlargement over time, or grows to greater than 2.2 in (5.5 cm) in diameter at which time surgery is suggested. At a diameter of 4 in (10 cm) surgery is the best option, as risk of rupture increases. Many patients live without symptoms, having the aneurysm identified during other medical procedures. After general anesthesia is administered, the surgeon will make an incision through the length of the sternum to repair an ascending, arch, or thoracic aortic aneurysm. Abdominal aneurysms are approached through a vertical incision in the abdominal wall. Depending on the location of the aneurysm, cardiopulmonary bypass with deep hypothermic circulatory arrest (arch), cardiopulmonary bypass (ascending), or left heart bypass (thoracic) may be required. All procedures require some amount of anticoagulation, usually heparin, to be administered to prevent blood clot formation. Clamps will be applied across the aorta to prevent blood flow into the aneurysm. The aneurysm will be opened to an area where the tissue is healthy. The healthy tissue will be sutured to a synthetic fiber fabric graft. The fabric is knit or woven Dacron fibers and may be impregnated with collagen, gelatin, or other substances. Blood flow is reinstituted to check for a secure seal. Additional sutures will be added to prevent leaking. The incision is then closed at the completion of the procedure with blood drains penetrating the incision during healing. Ascending aortic aneurysms may involve the aortic valve or coronary arteries. 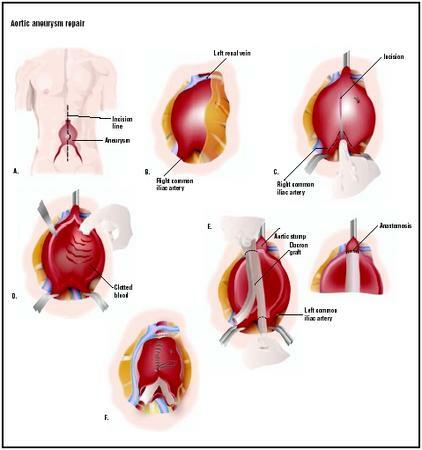 If the aortic valve is damaged, a graft with an integral aortic valve is used. The coronary arteries are reconnected to the graft. Aortic arch aneurysms require the reattachment of the arch vessels, the innominate artery, the left common carotid artery, and the left subclavian artery. To decrease surgery time, these three vessels can be treated as a single vessel by using part of the patient's native aorta to create an island. This island is then connected to the graft. Thoracic aneurysms require special care to protect the spinal vessels that supply blood to the spinal cord. Protecting the spinal cord during repair is still an area of intensive research. Some surgeons feel that rapid implant of the graft to restore blood flow is the best method to protect the spinal cord. A bypass graft called a Gott shunt can be used to redirect the blood flow around the area during surgical repair. Left-heart bypass provides the same benefit as a Gott shunt, with the addition of a mechanical pump for more controlled blood flow to the abdomen and lower extremities. The abdominal aortic aneurysm is repaired by rapid anastomosis of the graft to return blood flow to the circulation. If the renal arteries are involved in the aneurysm, they will be reattached to the graft. Additionally, if the superior celiac, mesenteric, or inferior celiac arteries are involved, they will also be reattached to the graft. Finally, it is common for the bifurcation (separation into two) of the iliac arteries to be involved; this may require a Y-shaped graft to be used to reattach both lower limb vessels. A simple x ray may provide the initial diagnosis of aortic aneurysm. Initial diagnosis can be made with non-invasive transesophageal echocardiography or ultrasound. Additional tests such as magnetic resonance imaging (MRI) or computed tomography (CT) will allow for additional visualization of the aneurysm. An angiography is the preferred method for determining the severity. Blood vessel and aortic valve health can be evaluated. Following surgery the patient will be cared for in an intensive care unit . Cardiac monitoring will be continued for blood pressure and heart function. Intravenous fluids will continue to be given, and may include blood products. Additional medications will be continued to support cardiac function as needed. The ventilator will be removed after the patient is able to breathe on his/her own. The stay in the intensive care unit is approximately two to five days with hospital discharge following a week. There are risks associated with general anesthesia, not associated with the aortic aneurysm repair. Additional risks of cardiopulmonary bypass are not associated with surgical repair. Depending on the type of aneurysm involved, the risks can differ significantly. Since blood flow to the spinal cord is jeopardized by the surgical repair, thoracic aorta aneurysm repair carries a relatively high rate of paralysis. Ascending arch aneurysms may jeopardize coronary blood flow and aortic valve function. Infection of the sternum can influence recovery time. Renal function can be impacted by abdominal aortic aneurysm repair. Renal function may improve or remain compromised. Long-term complications associated with the abdominal surgery include intra-abdominal adhesions, small bowel obstructions, and incisional hernia. Aortic arch aneurysms carry a risk of brain damage associated with deep hypothermic circulatory arrest. Repair of the aneurysm will provide normal blood flow to the systemic circulation. Pain associated with the aneurysm will be relieved by the repair. The risk of aneurysm rupture will be eliminated. During 1999 over 15,000 deaths in the United States were attributed to aortic aneurysm as reported by the American Heart Association. Without treatment, the five-year survival rate is 13%. The Multicentre Aneurysm Screening Group studied non-emergent abdominal aortic aneurysm repair, showing a 2–6% mortality rate at 30 days post surgery. Emergency surgeries demonstrate 37% mortality. In another study, treatment of cardiac disease by open heart surgery, not cardiac catheterization intervention, demonstrated a better outcome prior to elective treatment for abdominal aortic aneurysm. During treatment of thoracic aneurysm repair the incidence of paraplegia is 6–10%. Left vocal cord paralysis is recognized if the laryngeal nerve has been compromised by the procedure. Multiple organ failure is incident in death, with respiratory failure being among the most common. If the aneurysm is above or involves the renal arteries, renal failure can occur in 4–9% of patients. Treatment of the ascending aorta and aortic arch repair carry many of the risks associated with cardiopulmonary bypass, including hemostatic difficulties, left ventricle dysfunction, or myocardial (heart muscle) dysfunction. Irreversible brain damage is also an additional risk. Cardiac function can be compromised in all patients with thoracic or abdominal aortic aneurysms. Hemorrhage is of frequent concern and is more of a risk as the number of suture lines increases. Forty to seventy percent of all deaths can be contributed to cardiac malfunction and blood loss. Endovascular graft placement is being used as a suitable option to the open surgical procedure. The endovascular graft can be placed using minimally invasive techniques that reduce or eliminate the stay in the intensive care unit. Light sedation and epidural anesthetic are often adequate. Hensley, Frederick A., Donald E. Martin, Glenn P. Gravlee, eds. A Practical Approach to Cardiac Anesthesia. 3rd Edition. Philadelphia: Lippincott Williams & Wilkins Philadelphia, 2003. Busch, T., et al. "Importance of Cardiovascular Interventions Before Surgery for Abdominal Aortic Aneurysms." Cardiovascular Surgery 18 (2000):18–21. Cooley, D. "Aortic Aneurysm Operations: Past, Present, and Future." Ann Thorac Surg 67 (1999):1959–62. "The Multicentre Aneurysm Screening Study (MASS) into the Effect of Abdominal Aortic Aneurysm Screening on Mortality in Men: A Randomized Controlled Trial." The Lancet 360 (November 2002):1531–1539. Porter J. M., et al. "Endovascular Aortic Grafting: Current Status." Cardiovascular Surgery 7 (1999):684–691. American Heart Association. 2002 Heart and Stroke Statistical Update. Dallas, TX: American Heart Association, 2001. Cardiothoracic or cardiovascular surgeons or vascular surgeons can perform these procedures. Abdominal and thoracic aortic aneurysm repairs require less sophisticated equipment during the surgical procedure, but do need extensive intensive care post-operatively. Anesthetic management plays a crucial role in the decrease in complications associated with these procedures. Facilities that can also provide cardiovascular surgery are best equipped to manage these patients, but this is not a limitation for all procedures. How many of these procedures have been performed by the surgeon? What is the mortality rate for this procedure at the institution? What side effects are associated with this surgical procedure, and at what rate are they experienced by patients? What is the expected length of stay in the hospital? Are there any other suitable procedures, such as endovascular grafting? How long before normal activities, exercise, work, and driving can be resumed? My father is 75 years old and has been in federal prison since 2006. He just went through a aorta replacement in Sept of 2007. The prison is extremely cold, Is this a problem for his recovery. My Gramps who's about to turn 81 has been diagnosed with AAA. Aortic aneurysms are usually repairable. Small ones can be monitored, and medium to large ones can be repaired either with a graft to replace the weak spot entirely or with a less invasive procedure called endovascular surgery. In that procedure a graft is threaded through an artery in your leg and into place in the aorta. It is somewhat like repairing plumbing- either by replacing that section of pipe, or sliding a slightly smaller diameter pipe through to cover the weak spot. While I wouldn't say either was a walk in the park, it beats walking around hoping it doesn't rupture. As far as you go, you should probably have at least a pelvic ultrasound done annually to keep an eye on things. It may be there is a genetic component involved, maybe not. But the ultrasound is easy to do, and it beats worrying and wondering. My father had a thoracic aortic aneurysm surgery performed in a hospital that had not performed this treatment ever before, some years ago and passed away on the operation table because of heavily bleeding. The hospital utilised a cell saver machine to perform this operation. Our understanding is that a bypass machine is required to perform this type of surgery. When asked why the bypass machine was not utilised, we are not getting any answers but only told they used a cell saver machine. could anybody explain this surgery in detail, the prefered machines, their benefits, the difference and function of this eqippment. Our family still have this guilt, and believe proper equippment were not used. Please help us to know the facts. After having my aeortic repair I find that I have completely lost my taste buds - is this common after such a procedure and does it usually return? My aorta aneurysm measure 4.6.4 I have asked over and over again to have it repaired, its like they draw a line in the sand and they say its not a 5.0. I have insurance that will pay all medical, so rest assure that they will get their money. Not only that they are not the one with the problem Iam. Should i talk to my cardiologist again , he is all for me to have it done its the surgeons that will not do it. And they have told him over and over again that it should be done . What do i do. Iam scared to death to have it done but i feel it should be done sooner or later. Everytime i go to the the Rs it seen that grow. Should I tell my cardiologist to find me another surgeon. Help . My partner had a TAAA surgery 2months ago .he has recovered very well but recently he has been twitcing a lot and has some numbness in his left hand and fingers.are these side effects to the surgery as he was ok before the surgery? I had a dissection of my descending aorta 2 years ago. I am a 55 y/o female. It was only 4 cm when it dissected. Found out I have congenital connective tissue disease and bicuspid aortic valve. I had open surgery and a Dacron graft. I still have shortness of breath, angina, and am tired all the time. The recovery time is extensive so do not be suprised if the recovery is several months. I am not overweight, do not smoke or drink etc. So yes it can happen to anybody. 1) During surgery, will the blood flow be diverted even though the renal arteries are involved ( the TAA is anterior and posterior to the renal arteries). 2) Or will the cellular replacement cardiac machine be utilized? 3) After recovery, will there be decreased preexisting femur head,leg pain and old post surgical laminectomy pain, as well as less fatigue? 4)When the graft includes the healthy renal arteries, will blood flow improve in them? Thanks All for your inputs and experiences into open TAA surgery in advance. I want to know everything I can about it presurgery. my husband had a aaa repair 3weeks ago and can hardly walk he said his legs are like lead is this normal.He is on dyallis 3times a week thank you. I have been dealing with plntaar faciitis for several months now and have tried several different remedies. I wear ankle braces at night to keep my feet flexed, I stretch my feet several times a day, especially before getting out of bed, I ice them at night, I soak with epsom salt water, and sometimes with tea tree oil, and I take the maximum dosage of anti-inflammatories every day. I also bought a good pair of orthotics for my shoes and wear them all the time. I am a runner and was running up to 5 miles per day until the pain in my heels got so bad I had to reduce to 2 miles every other day. I try to alternate running days with work on the elliptical to maintain my cardio endurance, but it just isn't the same as running. I would like to get back up to the 5 miles I was running and build up to even more, as I would like to do a half marathon in the near future, but I can't see that happening until I can resolve this issue with my feet. Any suggestions you have to alleviate this problem would be greatly appreciated! My father has no taste buds after carodid artery surgery. Is this normal? Will taste come back? It's been two years. I have an Ascending Aortic Aneurysm which measures 4Cm. My CT Surgeon does not suggest that I should have any surgery at the present time. I am concerned if I should have surgery now or wait till it has grown to 5Cm as he suggested. I am small in stature if that has anything to do with having surgery, or should I get a second opinion? Thanks!!! My daughter is 26 with an ascending aortic aneurysm that extends down to a descending one as well. Can this type be surgically repaired and what can one expect of life after surgery. My dad is now 92 and he has the symptom of Abdominal Aortic Aneurysm (AAA) since August 13, 2015. The size of AAA is about 6-7 cm and we are unwilling to treat by any known surgical procedure due to his age. If the procedure is 100% fool proof we may think about it. I would be grateful to know any helpful suggestion whether there is any chance of recovery without any surgical method? Is there any recovery by medical or medicine? Thanks..
i too have a 4.6 aortic aneurysm, they are watching it, i go back in a year. i am 67 years old i could be gone in a year. i wan"t them to fix it now not wait until it rupture! should i wait or get a 2nd opinion? I had surgery 5 years ago to replace a bicuspid aortic valve and ascending aortic aneurysm. It went well and I was back to work in 6 months. Unfortunately I've never met anyone who's had the same operation to discuss concerns with and to ask if certain things were normal. The last six months I've had odd sharp pains in the sternum and off to the side. Optimistic me says it's indigestion or the wires holding the sternum together digging in, but pessimistic me fears degeneration of the artificial bits keeping me going. Has anyone else had these fears in a similar situation, and if so have they had it investigated? I had a complete aortic arch replacement with synthetic. Thank God for Kettering, Ohio hospital. 7 weeks complete discharge. Still afraid to lift anything. Anyone have advice for this 58 year old? Janet B - Just seen your post. I had what sounds like exactly the same op in 2002. I have had no problems whatever. I am now 48 and wanting to exercise seriously (maybe doing a triathlon) and have similar fears to you about the artificial bits bursting. But I guess the advantages of exercise outweigh the risks of the extra stress on the valves and arteries? I am on Metoprolol 100mg daily. Im 34 yrs female have DVT,have a mass on my left in the superior mediastinum above the aortic arcj and adjacent to the vertenral body T3/4 was 3.24 X 3.30 X3.53cm but has grown 3 time bigger can u please tell me whats going to happen before surgery,during surgery and after surgery how long will procedure take and how long will i be in ICU how long will i take to recover and what are the risks? I had an arch aortic aneurysm graft put it 3 years ago I was 51 years old. It is a really hard surgery I was depressed for a while but with a lot of love from my friends and family I have made it. I will probably never be the same I think when anyone that goes on the heart and lung machine are never the same.I have a lot of anxiety that the graft is going to break. Has anyone else had this surgery and felt the same way? I forget a lot more than I ever used to. I do thank god everyday that I made it through the surgery because a lot of people don't. For those that have one and it is over 4 if you get pain in your upper back go to the hospital and they will take you right in cause it could be a sign of it leaking.